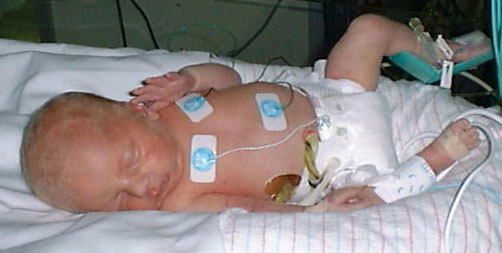 When we were first born we spent some time in the Neonatal Intensive Care Unit at Desert Regional Medical Center. I, Nicholas, was referred to as Baby "A" because I was born first. There were a bunch of weird wires hooked up to us, you can see a lot of them here. Our Mommy and Daddy came to visit us a lot. Below you can see a picture of Brandon, Baby "B", all stretched out. I guess he was happy to finally get out of that cramped womb. Look at how big the diapers are on us.